The recent announcement by Canfor and West Fraser that they were both closing sawmills in the B.C. Interior seems to have caught many in the industry by surprise. While the timing of the announcement was slightly sooner than previously forecast, these closures should be of no surprise to subscribers of WOOD MARKETS’ 2010 and 2012 Editions of the B.C Interior – Mountain Pine Beetle Attack: Impact & 20-Year Outlook reports. As WOOD MARKETS and its strategic partners have forecast from the outset, and somewhat contrary to the recent quotes in the media, these two specific sawmill closure announcements are the most recent in a long list of predicted mill closures in the wake of the mountain pine beetle (MPB) epidemic which exploded starting in the late-1990s in the B.C. Interior. The authors of the two previous B.C. Interior 20-year outlook reports have been following the progression of the MPB since the very beginning and see that the latest two mill closures were consistent with our earliest predictions made in 2010. By understanding and modeling the economics of sawing dead mountain pine beetle logs and the shelf-life of dead timber, the outlook for the sawlog harvest and lumber production has been relatively predictable in our reports. While the exact timing of mill closures is unknown and is tied to individual company strategies, as is the case with these two announced mill closures, there are more mill closures to come—as was originally forecast. This forecast was predicated on a reduction in the sawlog supply that would occur as the economics of milling dead timber fell in response to the MPB epidemic. The loss of economic sawlogs was forecast to eliminate about 20 per cent of the B.C. Interior sawlog supply. It was also assumed that remaining sawmills would have to operate at less than capacity in order to balance the remaining mid-term sawlog supply with sawmill demand. Following the Canfor and West Fraser sawmill closure announcements, there are now 12 sawmills that have closed since our March 2010 prediction of 16 sawmill closures. And we see additional sawmills closing, especially in the Cariboo region (Quesnel, William Lakes, and 100 Mile House) of the province where a sawlog shortage is becoming most acute. Given the obvious motivations of companies like Canfor and West Fraser to ensure that there are adequate sawlog supplies sufficient to operate their remaining mills at capacity through initiatives like strategic mill closures and timber tenure swaps, this trend suggests that our 2018 forecast of 16 sawmill closures may be conservative. 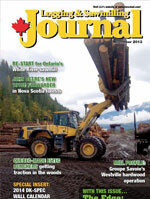 Since 2005, there have been 24 sawmills or veneer/plywood mills in the B.C. Interior that have closed or were not re-built (two of the sawmills destroyed by fire will be back in operation in 2014). Some of these closures were the result of the U.S. housing market and global financial crisis downturn, but all were directly related to MPB impact of reduced economic sawlog supplies occurring by the end of the current decade. WOOD MARKETS and its strategic partners keep current B.C Interior timber and lumber forecasts that are consistent with the economics of processing dead sawlogs that also align with North America and global demand trends, including the key role of China. Like the 2010 outlook report, the 2012 analysis provides a detailed and comprehensive wood fibre supply forecast for the B.C. Interior over the next 20 years. Also profiled is a 20-year North American lumber outlook showing the impact of reduced lumber supplies from B.C. (and Canada). The proprietary “B.C. Fibre Model” has been applied to those B.C. Interior regions that have been most affected by the MPB epidemic to assess the impact that it will have on key forest products, including: log supply; softwood lumber; plywood; residual fibre (chips, sawdust, shavings and hog fuel) production; and biomass. Russ Taylor is President of International WOOD MARKETS Group.